If you are lucky enough to visit somewhere special like the Birr Castle estate it pays to have a good guide otherwise (as I always say) you may as well be looking into a ditch! Besides it is a 1200 acre estate with an awful lot to see so unless you have got all day it is easier to hop on a buggy tour and get chauffeured around. 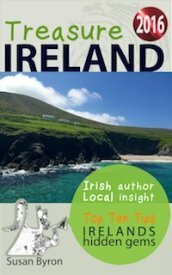 The guides really know their stuff ie the history of the castle, which is closed to the public, the scientific achievements of the Earls of Rosse, intimate details of the flora and fauna on the estate as well as the social history of Birr itself. It is also especially useful if perhaps you are unsteady on your feet, lazy or lazy or (like me) always in a rush. You can do the tour in 45mins at a push, but these guides are so good and so knowledge that they can run to a couple of hours if required, which is great value at €5 per person regardless, depending on your level of interest (they have no shortage of fascinating facts and stories) and will tailor the tour to meet your needs. And they are quite happy to stop up for anywhere for closer examination or photo opportunities, the colourful herbaceous border at Birr Castle is one of the most famous in Ireland. The poor man must have been sick of me, but Damien also know all the best angles, in fact he photographs the gardens and the various specimens in bloom daily throughout the year and posts them on their facebook page drawing comments from all over the world. 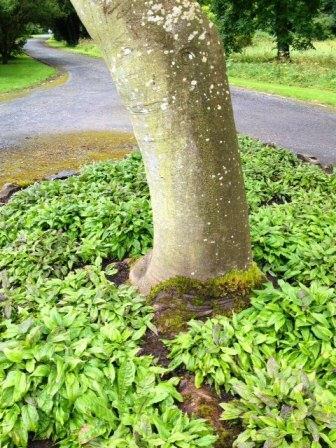 My favourite was the Elephant’s Trunk tree planted in memeory of the 6th Earl of Rosse. There are great events at Birr Castle including Vintage week, the Game & Country Fair and the Balloon Championships in September. You can check the details or book a tour at the link below. 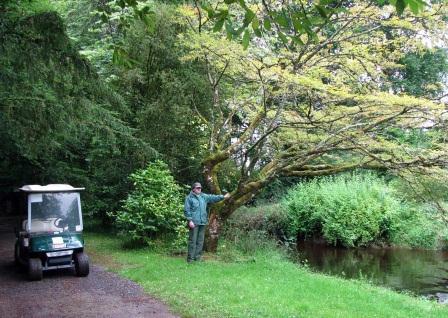 To book a buggy tour of the Birr Castle estate please click here.